By The Chas. Fischer Spring Co. of Brooklyn, New York. Very good '+' frames with only light wear to the plating. These are manufactured with the 'streamlined' pattern vents on the frame. Stamped with 'AN6530' on the centre hinge. Fitted with an excellent set of American Optical marked green glass lenses. The rubber cushion remains supple and is undamaged. The chamois backing has light even soiling. The strap is also very clean and retains excellent elasticity. With original box of issue showing some soiling and minor damage. 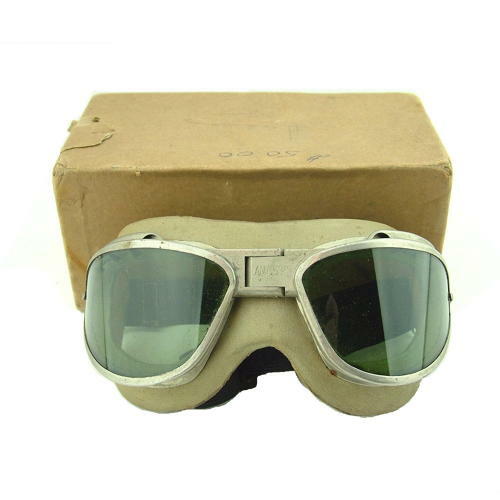 A very good lightly used pair of these classic AAF goggles. Stock code G22341.